1. Open your bag (B) and go to the Socket tab. 2. Insert your equipment. If there is no socket in your equipment, you will need a Socketing Rod. You may either buy it from the Item Mall or loot it from a variety of monsters. 3. Select an empty space to create a socket in your equipment. 4. Drag your Gem into the socket and you are done! 1. Go to Starglade City. Open your bag (B) and click My Shop. 2. Insert a title for your shop. Next, put the items you would like to sell with a set price. Your shop is now open! Note: You must remain online to use the Private Shop system. 1. Open your bag (B) and click Split Stack. 2. Choose the items you wish to split. 3. Insert the number and the items will now be split up. With disenchantment, you may insert any level 30 (or higher) green (or higher) equipment, receiving many materials and items. 1. 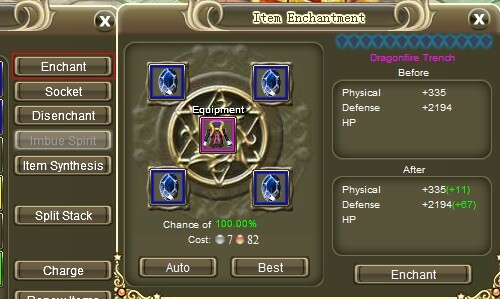 First, open your bag (B) and click on Enchant. 2. Place your equipment in the middle socket. Insert Enchantment Dust/Stone/Crystals in the surrounding sockets. 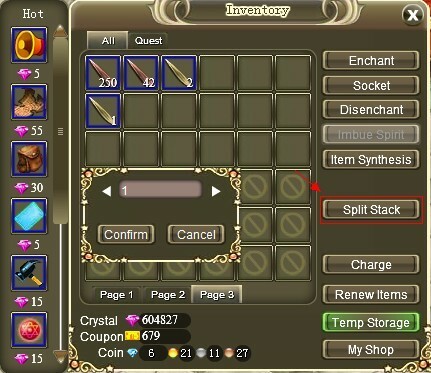 You may select “Auto” or “Best”, and the system will find required materials in your inventory. The higher quality the Enchantment material is, the higher the successful rate will be. Auto: Automatically select materials currently in your inventory. Best: Find the best enchantment materials for the equipment. If you currently do not have the material, it will suggest buying it from the Item Mall. 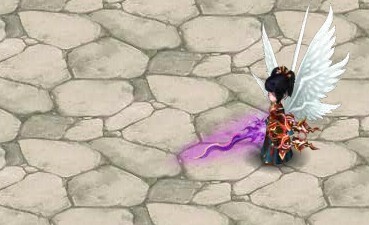 Additionally, once your weapon level reaches a certain level, it shows rays of colorful light. • Attacking monsters will reduce the durability of your weapon. • When you are being attacked, the durability of your armor will decrease. Repairing equipment – Repairs may be made at ALL venders. A normal repair will completely repair an item. The lower an item’s durability is, the more costly it will be to repair it. A master repair will not only completely repair an item, but will also prevent it’s durability from decreasing in the future. This is more expensive than a normal repair. some items cant be draged out … what then ? 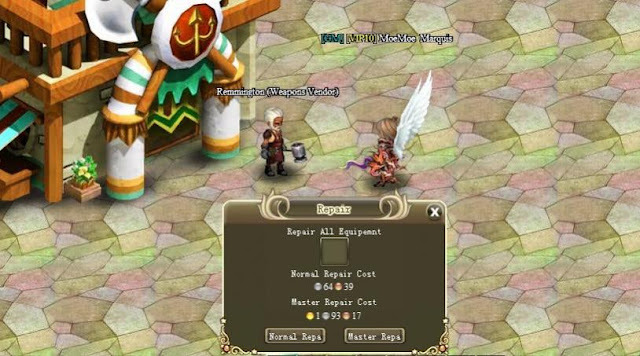 If you normal repair an item is there any way to restore it to max durability later? Is providing 250 MD to enchant a weapon needed? what u mean by "prevent it’s durability from decreasing in the future" ?? how do i delete items from my inventory to make room?